Widely regarded as one of the greatest writers in the French language, the prolific playwright Molière wrote and directed more than thirty plays. Many revere Molière as a comedic genius, but he should also be recognized for his use of needlework references to comment on the narrow scope of women’s lives in his time. 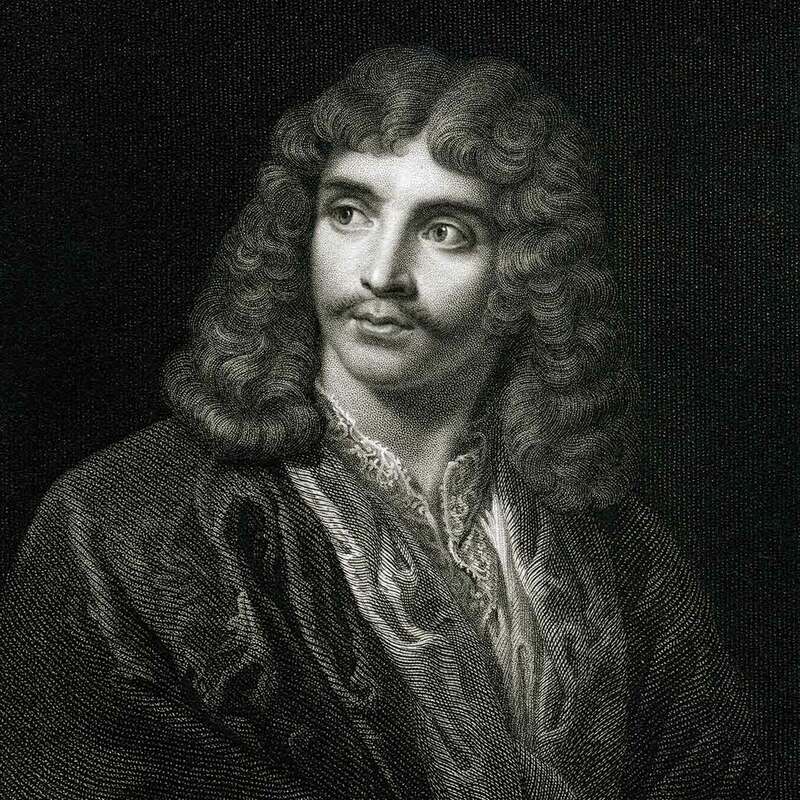 Jean-Baptiste Poquelin, who later in life took the stage name Molière, was born in Paris in January 1622, the son of Jean Poquelin (1595–1669) and Marie Cressé (1600–1632). Molière’s father was a prosperous upholsterer, as were both Molière’s paternal and maternal grandfathers. In 1631, Molière’s father became the holder of an office in the royal household of Louis XIII (1601–1643), the king of France. During his quarterly annual term as a keeper of the king’s carpets and upholstery (tapissier ordinaire du roi; eight valets filled this function, two at a time, for a quarter of the year), Molière’s father cared for the king’s furniture, helped make the royal bed, and accompanied the king on his travels. The holder of such an appointment could sell or transfer his office by contract, and, in 1637, Molière’s father arranged for Molière to succeed him upon his death or relinquishment of the title. After completing his education, Molière began the study of law. Although he was likely admitted to the bar, he never practiced law. Instead, after substituting for his father as a keeper of the king’s carpets and upholstery on a journey to southern France by Louis XIII, he ceded his rights to his father’s royal appointment and enrolled in a theatrical company to pursue a passion for acting dating back to his childhood visits to the theater with his maternal grandfather, Louis Cressé (unknown–1638). Engraving from 1833, featuring Jean-Baptiste Poquelin better known by his stage name Molière. Photo by traveler1116/Getty Images. In 1659, Molière’s play The Pretentious Young Ladies, a satire on French society and manners, premiered at the Petit Bourbon Theater in Paris. This play was quickly followed by Molière’s popular farces Sganarelle, or The Imaginary Cuckold in 1660, The School for Husbands in 1661, and The School for Wives in 1662—Molière’s so-called “jealousy” series. The School for Husbands is a comedy about two brothers who are courting their wards. Sganarelle, a bourgeois Parisian, seeks to protect his young female ward by isolating her from worldly influences (“like any prudent girl, she’ll stay indoors and occupy herself with household chores; in leisure time she’ll mend my linen, or make some knitted stockings for amusement’s sake”), whereas Sganarelle’s brother treats his intended wife as more of an equal. 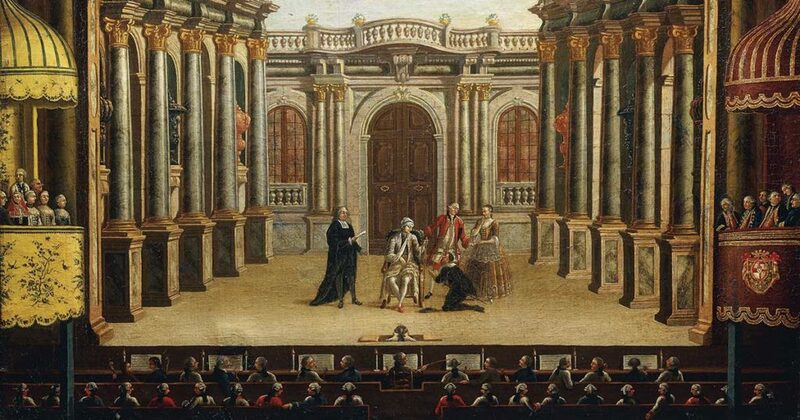 In poetic justice, the play ends with Sganarelle’s brother succeeding in his courtship, while Sganarelle loses his ward. In The School for Wives, a satire about the limited education young French women received, Molière returns to the theme of forced ignorance. The play centers on the efforts of Arnolphe, a small-town property owner, to keep his intended wife, his naïve ward, Agnes, ignorant in order to ensure her fidelity. Indeed, Arnolphe states that he wants his future wife “to be utterly ignorant. To be blunt, it will be fine by me if she can say her prayers, if she loves me and knows how to sew and spin.” Molière further emphasizes Arnolphe’s focus on Agnes’s needlework when Arnolphe remarks upon Agnes’s entering the room: “She’s got her embroidery with her. That’s a good sign.” As with Sganarelle’s plan with his ward, Arnolphe’s attempts to isolate Agnes fail, and the play ends with Agnes becoming her true love’s betrothed. Molière’s final play, completed in 1673, is The Imaginary Invalid (affiliate link). Like his 1666 play The Doctor in Spite of Himself, the play attacks the medical profession. 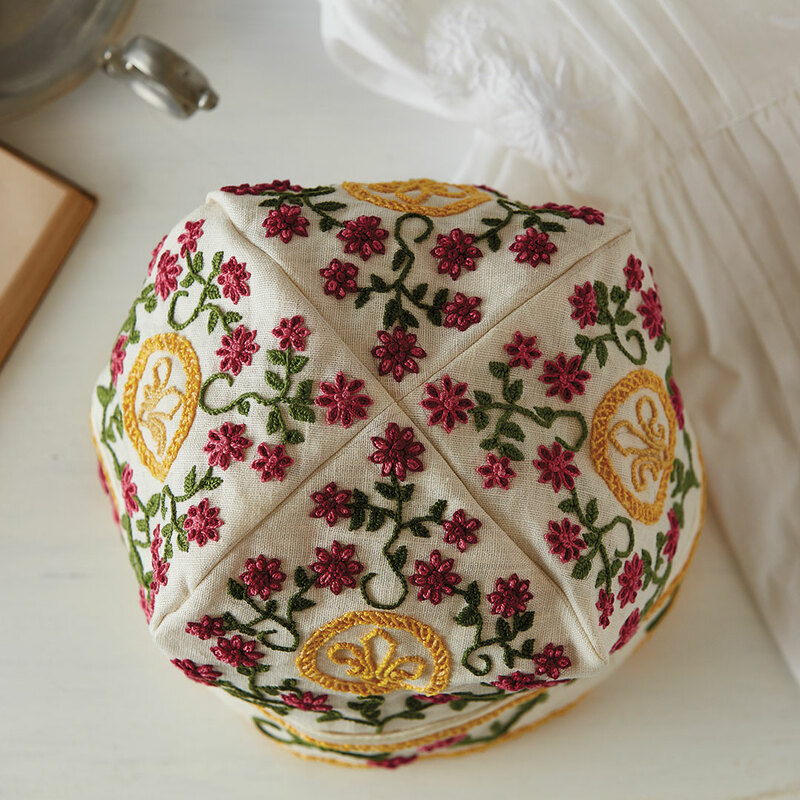 The project that accompanies this article is based on the embroidered nightcap Molière wore when he performed the lead role of the extreme hypochondriac in The Imaginary Invalid. Molière collapsed during the fourth performance of the play on February 17, 1673. He revived to finish the performance, but, coughing blood, died at his home later that evening. Mimi Seyferth is a lawyer who lives outside Washington, D.C. She was introduced to the theater of Molière as a high-school French student when her aunt and uncle took her to a performance of Le Misanthrope by the Comédie-Française in San Francisco. The above is adapted from Mimi’s fascinating article in the Spring 2019 issue of PieceWork. Molière, clearly brilliant, was so ahead of his time. I hope Mimi’s article will serve as a catalyst for many to go back and reread his plays. It really is remarkable that he paid so much attention to needlework and to the plight of women. As Mimi mentioned, her companion project is an embroidered nightcap. The nightcap worn by Molière during his last performance is now in the collection of the Museum of the Comédie-Française. It inspired Mimi to write her article and design her project. Thank you, Mimi, and thank you, Molière! Here are the details for Mimi’s nightcap. We’re certain Molière would approve! Mimi Seyferth’s embroidered nightcap was inspired by one worn by Molière during his last performance. Photo by George Boe. If you are wondering about the practical use for a nightcap, here’s Mimi: “Nightcaps such as Molière’s were commonly worn by distinguished gentlemen in Europe and England during the sixteenth and seventeenth centuries. The word “nightcap” is a misnomer in that men did not wear nightcaps to bed; instead, they wore the nightcaps at home on semiformal occasions. This and so much more is in the Spring 2019 issue of PieceWork! 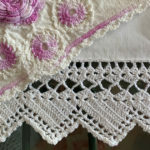 There are projects to knit and embroider and articles exploring the rich history of needlework. Details are in my preview of the issue here. Featured Image: The stage during a performance of The Imaginary Invalid by Molière in Menorca, Spain. Paris, Musée Des Arts Decoratifs (Art and Crafts Museum). Photo by DeAgostini/Getty Images. Many other playwrights and authors include needlework references in their work. You’ll find several in these issues of PieceWork!